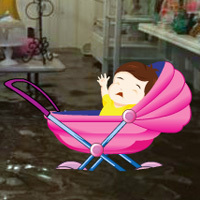 Wow Save the Baby from Flood is another point & click escape game developed by WowEscape. In this game, you are caught in a flood. But unfortunately, you noticed that a baby is caught there, too. You have to find the way to save the baby by finding useful objects, hints and by solving puzzles. Click on the objects to interact with and solve puzzles. Good luck and have fun! yw, Jeri - always at your service! Sneaky hotspot on wooden hut in scene with orange dots hint. Found last bucket left of 4 green leaves placed. Out. Nice game. Thanks WOW! Baby saved....good game, thanks WOW.